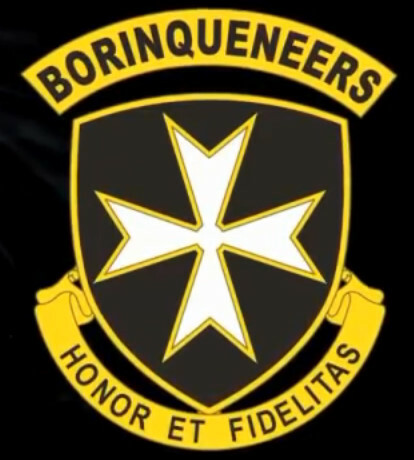 Some great historical information on our legendary heroes, the 65th Infantry Regiment Borinqueneers, hailing from Puerto Rico! Click on the button below to see how you can help champion this HISTORIC cause! The First Company of native Puerto Ricans enlisted in the new "American Colonial Army" 1899. The 65th Infantry Regiment prides itself on its long, rich tradition of military history, service, and achievements. 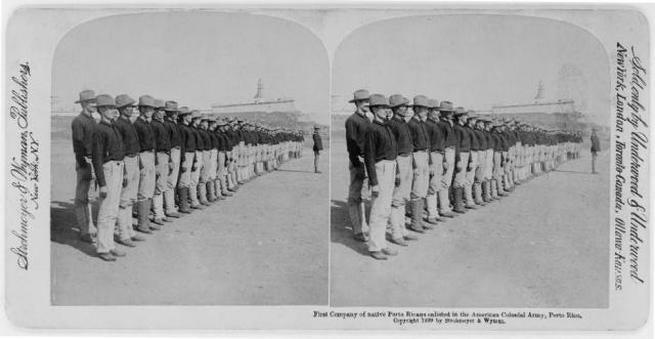 Since the first shot of World War I which originated from "El Morro" San Juan, Puerto Rico, to the end of the Korean War, over 100,000 Borinqueneers have distinguished themselves as true American war heroes. 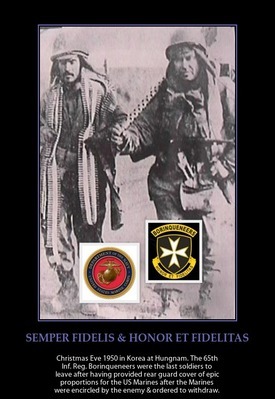 After all, the Borinqueneers' motto is "Honor Et Fidelitas" which is Latin for "Honor And Fidelity"! 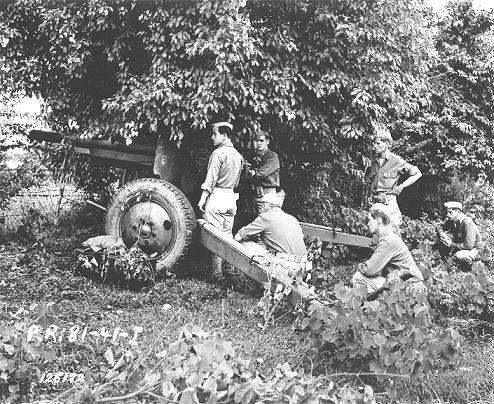 Borinqueneers artillery unit training in Bayamon. March 2, 1917 - Jones-Shafroth Act passed giving US citizenship to Puerto Ricans. May 1917 - Regiment returns to Puerto Rico in Mar 1919. 1943 - Again deployed to guard Panama Canal against attack by the Axis. where they had first combat action in WWII, 47 battle casualties. 1945 - Served in Mannheim, Germany during occupation. July 26, 1948 - Executive Order 9981 was an executive order issued on July 26, 1948, by President Harry S. Truman. It abolished racial discrimination in the United States Armed Forces and eventually led to the end of segregation in the services. This decree would take years to take effect within the 65th Infantry Regiment. Korean War. Regiment eventually assigned to serve as part of 3rd Infantry Division. 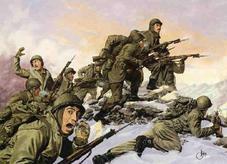 Marine and elements of the 7th Infantry Division's retreat from the Chosin Reservoir, North Korea. One of the biggest military withdrawals in US military history. February 2, 1951 - Two battalions of the 65th Infantry charged Chinese positions for the last Battalion-Sized Bayonet Charge in U.S. Army history. February 14, 1951 - Saved 3rd Division HQ from being overrun by an infiltrating North Korean Regiment. July 25, 1952 - The "Commonwealth of Puerto Rico" government status is proclaimed and Puerto Rico is officially no longer a colony. September & October 1952 - Involved in bitter, bloody fighting for Hill 167, Outpost Kelly (September) and then Outpost Jackson Heights (October). The battle for Outpost Jackson Heights resulted in 90+ Court Martials for various factors such as refusing to obey orders, misconduct in front of the enemy. The charges were all pardoned or remitted by the then Secretary of the Army, Robert Stevens. March 1953 - The Regiment is desegregated and is no longer a "Puerto Rican regiment. The Regiment is fully integrated among other Anglo fighting units. June 1953 - After reintegration, the 65th Infantry Regiment fought in the battle of Outpost Harry where 1st Lieutenant Richard Cavazos, a Mexican-American, earned the Distinguished Service Cross. 1st Lieutenant Richard Cavazos, a Mexican-American, would then become the only Hispanic Army four-star general in US Armed Forces history. By the end of the Korean War the 65th Infantry had suffered approximately approximately 750 killed and 2,400 wounded in action, making the Korean War the bloodiest war in Puerto Rican history. April 10, 1956 - Inactivated at Camp Losey, Puerto Rico. Feb 6, 1959 - The unit "colors" were transferred to the Puerto Rico Army National Guard where the 1st Battalion, of the 65th Infantry remains a functional National Guard unit serving in the nation's on-going military campaigns. Only unit from the active-duty military to transfer to the National Guard/Reserves. June 10, 2014 - President Barack Obama signs Bill H.R. 1726 awarding the Congressional Gold Medal to the 65th Infantry Regiment into Public Law 113-120. The Congressional Gold Medal is the highest civilian award in the U.S. and equivalent to the Presidential Medal of Freedom. The 65th Infantry Regiment is the second Latino-American recipient of the Gold Medal since Baseball Hall of Famer, Roberto Clemente. The first Congressional Gold Medal recipient was George Washington in 1776. 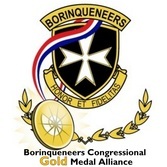 April 13, 2016 - The Borinqueneers Congressional Gold Medal was officially unveiled in a ceremony held at the U.S. Capitol Visitors Center in Washington D.C. in which many of the 65th Infantry veterans, their families, Secretary of the Dept. of Veterans Affairs, acting Secretary of the Army, key Congressional leaders from both chambers, and other dignitaries were in attendance. The event was spearheaded by the office of Speaker of the House of Representatives. Present and Future - The Borinqueneers legacy is continually weaved in the fabric of our society and honored as evident through various street/highway renamings, memorial dedications, commemoration events, parades, and other tributes. The following are several video clips which do a great job in narrating the history of the 65th Infantry Regiment in a brief format. We highly recommend these video clips for academic and educational purposes. "History of the 65th Infantry, 1899-1946"
﻿"Strictly Personal" ﻿book excerpt narrating then Major John Eisenhower's accounts of the 65th Infantry Regiment after the court-martial episodes. John Eisenhower is President Dwight D. Eisenhower's son. Link to free book download! The most decorated Puerto Rican soldier in US history: A proud "Borinqueneer", the late Don Modesto Cartagena served in WWII & Korea. He is a recipient of the nation's 2nd highest award for heroism, the Distinguished Service Cross, as well as the Silver Star, Legion of Merit, Bronze Star with oak leaf cluster and “V” device, the Purple Heart, and many others. 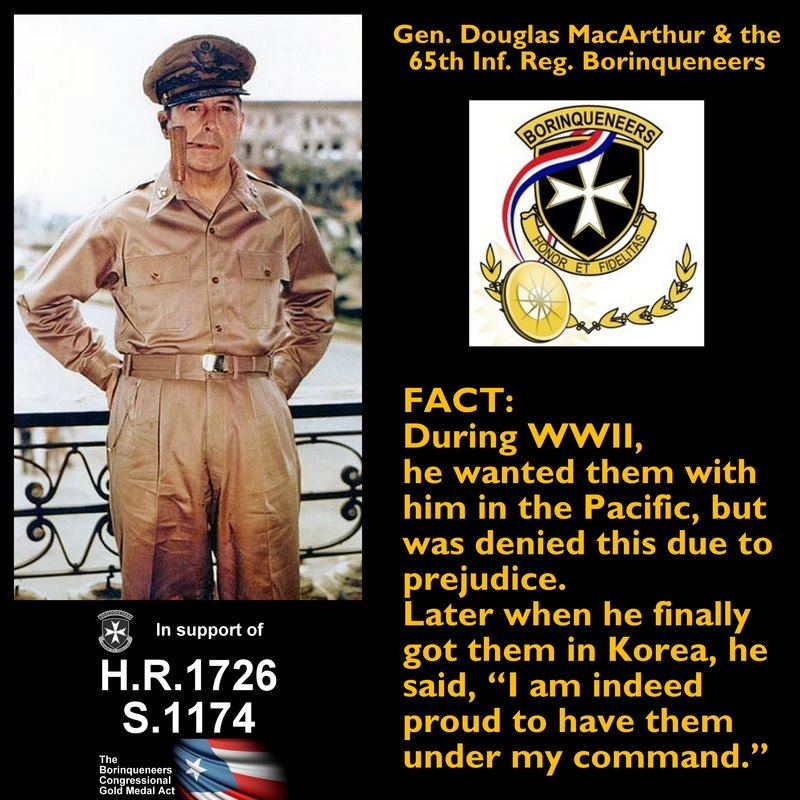 Honor this wonderful hero-patriot's lasting legacy and that of our other distinguished Borinqueneer brothers by writing to your 2 US Senators & 1 US House member to seek the Congressional Gold Medal for the "Borinqueneers"! His official citation reads: “The Distinguished Service Cross is presented to Modesto Cartagena (RA10404100), Sergeant, U.S. Army, for extraordinary heroism in connection with military operations against an armed enemy of the United Nations while serving with Company C, 1st Battalion, 65th Infantry Regiment, 3d Infantry Division. Sergeant Cartagena distinguished himself by extraordinary heroism in action against enemy aggressor forces in the vicinity of Yonch'on, Korea, on 19 April 1951. On that date, Company C was assigned the mission of capturing Hill 206, a terrain feature dominating a critical road junction. When the company assaulted the summit, it encountered stubborn resistance from a well-entrenched and fanatically determined hostile force. Sergeant Cartagena, directed to move his squad forward in order to approach the enemy positions from another ridgeline, led his men toward the objective, but, almost immediately, the group was forced to seek cover from an intense and accurate volume of small-arms and automatic-weapons fire. Locating the hostile emplacements that posed the greatest obstacle to the advance of the friendly forces, Sergeant Cartagena left his position and, charging directly into the devastating enemy fire he hurled a grenade at the first emplacement, totally destroying it. Ordering his squad to remain under cover, he successfully and single-handedly assaulted the second enemy position. Although knocked to the ground by exploding enemy grenades, Sergeant Cartagena repeated this daring action three more times. Finally, an increased volume of fire from the remaining hostile emplacements was concentrated on him and he was wounded. The extraordinary heroism and completely selfless devotion, to duty displayed by Sergeant Cartagena throughout this action enabled the company to secure its objective successfully with a minimum of casualties, reflect great credit on himself and are in keeping with the highest traditions of the military service. Headquarters, Eighth U.S. Army, Korea: General Orders No. 698 (September 16, 1951) Home Town: Puerto Rico." Richard E. Cavazos, a Mexican-American, earned his commission as a distinguished graduate from the ROTC program at Texas Technological University in 1951. 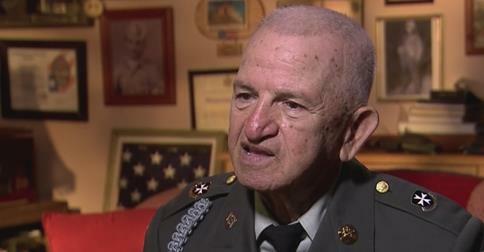 During the Korean War, as a member of the 65th Infantry Regiment, Cavazos won his first of two Distinguished Service Crosses for his heroic actions during an attack on Hill 142. Later, he attended the U.S. Army Command and General Staff College, the British Staff College and the Armed Forces Staff College. In 1967, Cavazos commanded 1st Battalion, 18th Infantry, in Vietnam. His valiant leadership of that unit in the attack at Loc Ninh earned him a second Distinguished Service Cross. After Vietnam, Cavazos served as commander, 2nd Brigade, 1st Infantry Division, and commander, 9th Infantry Division. In 1980, he became the innovative commander of III Corps. 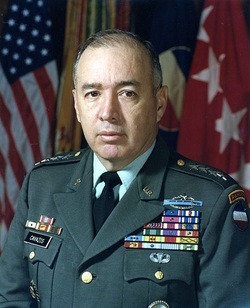 In 1982, Cavazos assumed command of the U.S. Army Forces Command and earned his fourth star, making him the first Hispanic four-star general in the Army. His early support for the National Training Center and his involvement in the development of the Battle Command Training Program enormously influenced and advanced the Army's warfighting capabilities. 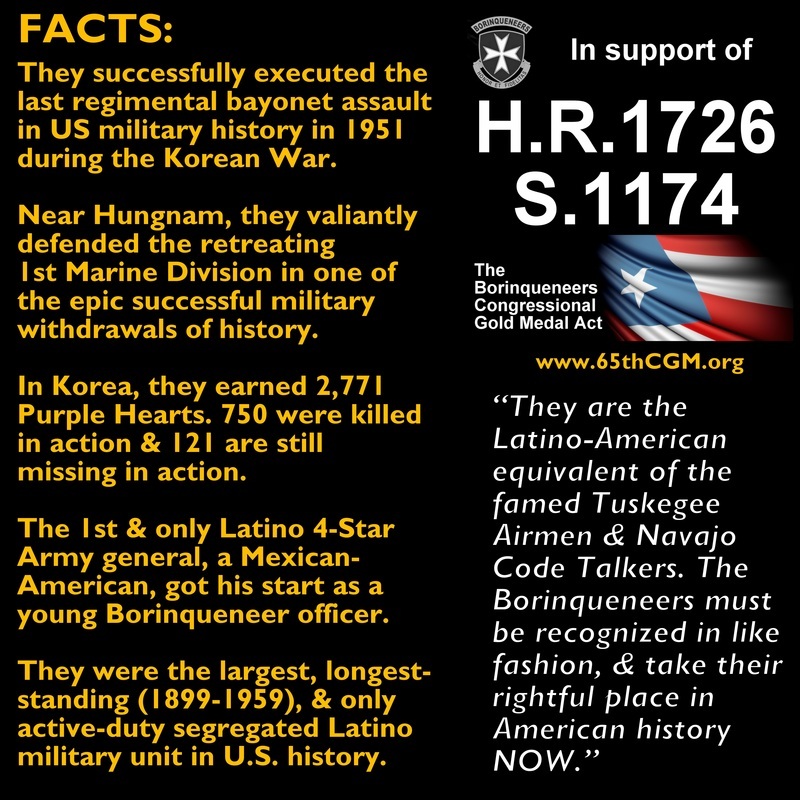 One of the pinnacle achievements of the Borinqueneers in Korea was when they rushed to the defense of the US Marines & stayed behind to fight off the enemy after the Marines were encircled & ordered to withdraw to Hungnam. 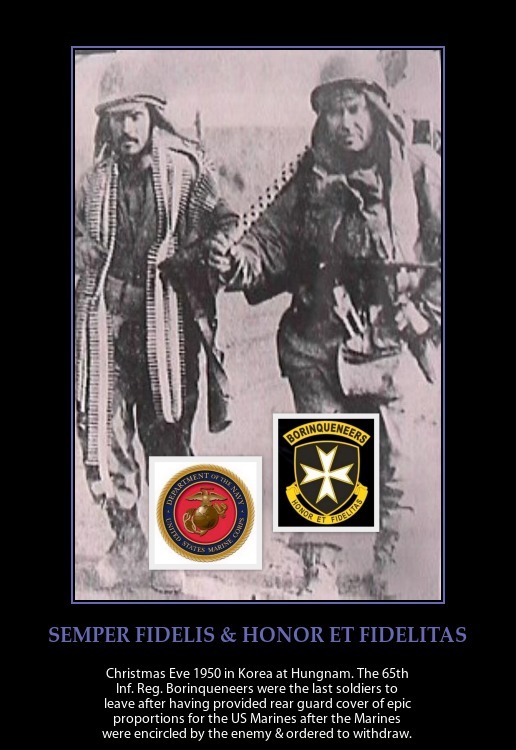 After providing rear guard cover of epic proportions for the Marines, the operation culminated on Christmas Eve 1950. 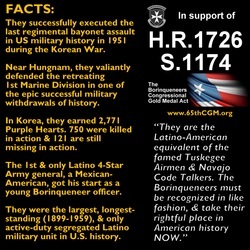 The last two US soldiers to board ship at Hungnam were Borinqueneers Cpl. Julio Guzman & Sgt. Major Lupercio Ortiz (see photo). 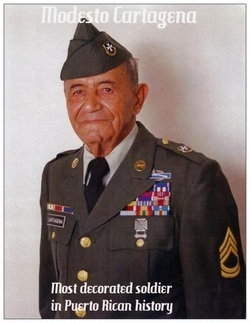 Borinqueneer Master Sergeant Pedro Rodriguez served in the 65th Inf. Reg. during WWII and Korea. He had joined the Borinqueneers in 1937 at the age of twenty five. Earlier, at age 14 after his father died, he took over his father's small business to support his family, delivering goods around Lajas, PR, with an ox cart. During Korea, He was awarded two Siver Stars in a one-week period. The first citation reads, "MASTER SERGEANT PEDRO RODRIGUEZ, RA6674697, Infantry, Company "F", 65th Infantry, 3d Infantry Division, United States Army. On 24 March 1951, near Kopi-Dong, Korea, Sergeant RODRIGUEZ, acting as platoon leader in the absence of a commissioned officer, was leading his unit to secure Hill 476, when the enemy opened fire from a well camouflaged machine gun nest. Although he did not know the exact location of the gun, Sergeant RODRIGUEZ ordered one squad to fix bayonets and assault the general area from which the fire was coming. After the enemy weapon fired again, Sergeant RODRIGUEZ charged the position, yelling and shooting his rifle demoralizing the enemy and causing him to flee in haste, taking his gun with him, but leaving ammunition and rations behind. The gallantry and extreme devotion to duty displayed by Sergeant RODRIGUEZ reflect great credit upon himself and the military service. Entered the military service from Puerto Rico." Several days later, he was awarded another Silver Star. The citation reads, "MASTER SERGEANT PEDRO RODRIGUEZ, RA6674697, Infantry, Company "F", 65th Infantry, 3d Infantry Division, United States Army. On 31 March 1951, near Choksong-myon, Korea, Company "F" was attacking Hill 398, defended by a firmly entrenched enemy supported by mortars. At some distance from the top of the hill, the lead platoon was halted by intense machine gun fire and fragmentation grenades, suffering several casualties. When Sergeant RODRIGUEZ received the order to move his platoon to assist the stalled unit, he ran forward and led his troops in a furious assault, causing the enemy to retreat hastily, thereby relieving the besieged lead platoon. Continuing his charge, Sergeant Rodriguez pursued the fleeing enemy and covered by friendly machine gun fire, he personally searched the area to rout any enemy troops which might have been left behind. The aggressive leadership and personal gallantry exhibited by Sergeant Rodriguez reflect the highest credit upon himself and the military service. Entered the military service from Puerto Rico." 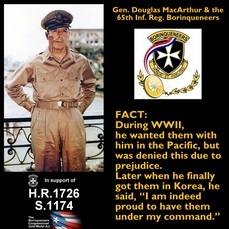 MacArthur requested that the Borinqueneers be assigned to him in the Pacific during World War II. The Pentagon denied his request because of prejudice toward the 65th. Cpl. 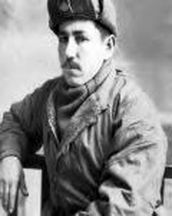 Enrique Vega Lugo of G company, 2nd Battalion, 65th Infantry Regiment, 3rd US Infantry Division. 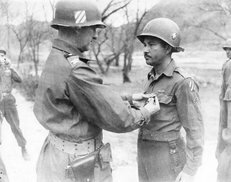 was awarded the "Silver Star Medal" from Col. Juan Cesar Cordero Davila, the Commanding Officer of the Borinqueneers, during a ceremony held at Regimental Headquearters in Korea on April 16, 1952. Col. Cordero received his own Silver Star later that year. See below. 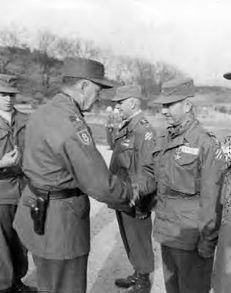 Borinqueneers Commanding Officer Col. Juan César Cordero Davila receives the Silver Star in Korea on Sept. 23, 1952. His citation reads: "Colonel Juan C. Cordero, 0222751, Infantry, Headquarters and Headquarters Company, 65th Infantry Regiment, 3rd Infantry Division, United States Army. 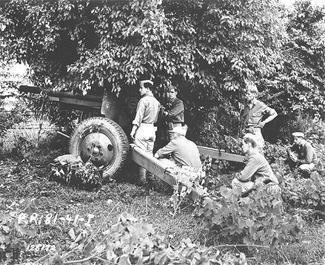 On July 20, 1952, Company "C" was attempting a withdrawal after completing a raiding mission on enemy positions near Chongdong, Korea. In the initial phase of the withdrawal the friendly troops were subjected to intense hostile automatic weapons, artillery and mortar fire from nearby enemy positions. Under the withering fire the men became disorganized and began to move in all directions. Realizing the necessity for the company to effect an orderly withdrawal and evacuate the wounded, Colonel Cordero, the Regimental Commander, continuously exposed himself to the hostile bombardment as he moved among the men, offering encouragement and directing them through the heavy enemy fire. Inspired by his courage, the men assumed the initiative and continued to move toward friendly positions. At this time the ridge line over which the withdrawal was to be made was subjected to heavy artillery and mortar fire. Despite the urging of his executive officer that he seek a place of safety, Colonel Cordero refused to leave his men, and with complete disregard for his personal safety, braved the enemy fire to ensure that all had reached safety and the wounded had been evacuated. Colonel Cordero's gallant and inspirational leadership was instrumental to the success of the withdrawal and reflects the highest credit upon himself and the military service. Entered the Federal Service from Puerto Rico." "The Distinguished Service Cross is presented to Richard E. Cavazos (O-64593), First Lieutenant (Infantry), U.S. Army, for extraordinary heroism in connection with military operations against an armed enemy of the United Nations while as Company Commander of Company E, 2d Battalion, 65th Infantry Regiment, 3d Infantry Division. First Lieutenant Cavazos distinguished himself by extraordinary heroism in action against enemy aggressor forces in the vicinity of Sagimak, Korea, on the night of 14 June 1953. On that date, Lieutenant Cavazos led his men in a raid on the entrenched enemy upon whom heavy casualties were inflicted. When a heavy barrage was laid on the position by the enemy, Lieutenant Cavazos withdrew the company and regrouped his men. Lieutenant Cavazos three times led the company through the heavy barrage in assaults on the enemy position, each time destroying vital enemy equipment and personnel. When the United Nations element was ordered to withdraw, Lieutenant Cavazos remained alone on the enemy outpost to search the area for missing men. Exposed to heavy hostile fire, Lieutenant Cavazos located five men who had been wounded in the action. He evacuated them, one at a time, to a point on the reverse slope of the hill from which they could be removed to the safety of the friendly lines. Lieutenant Cavazos then made two more trips between the United Nations position and the enemy-held hill searching for casualties and evacuating scattered groups of men who had become confused. Not until he was assured that the hill was cleared did he allow treatment of his own wounds sustained during the action."